The Outpatient Clinic in Jacksonville, Fla., was one of the first projects to be developed through the Department of Veterans Affairs’ (VA) new initiative to replace outdated facilities with modern, state-of-the-art clinics that provide veterans with access to the best medical treatment possible. 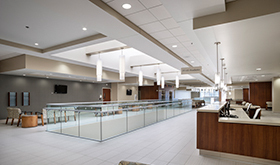 The VA selected US Federal Properties (USFP) to develop the two-story, 135,000 square-foot clinic that provides ambulatory care, mental health services, cardiology, radiology, dental and other specialty services to area veterans. USFP broke ground on the clinic in February 2011 and the LEED Silver Certified building was complete in October 2012. 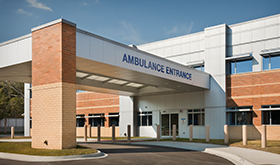 It was built with affordable, professional and permanent materials that give the clinic an architectural character that represents the state-of-the-art care provided in the facility. The clinic was designed to create a warm, non-institutional healing environment that balances the technological features that support effective delivery of modern, patient-centric healthcare. The design provides a comfortable and healing environment. To achieve a first-class facility inside and out, USFP paid close attention to detail and quality.